In negotiating agreements, the partners who do the drafting have an ethical obligation not to exploit the advantages of the drafting role. Some drafters don't meet that standard. 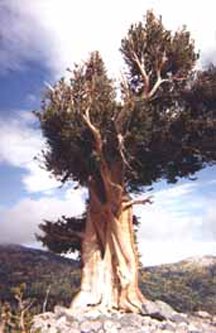 A bristlecone pine in the Great Basin National Park in Nevada. Bristlecone pines are the oldest living things on Earth. Although they thrive at timberline, where most trees cannot survive, they do also grow at lower altitudes. When they live at lower altitudes, they don't live quite so long. It almost seems as though they are in negotiation with Nature, exchanging longevity for ease of living conditions. Perhaps it is the harshness of the timberline environment that makes the wood of timberline bristlecones so resistant to the elements and to pests. Tough negotiations can produce solid, long-lasting agreements. But when one party uses deception to forge an agreement that truly harms the other, the longevity of the other, and therefore the agreement, is threatened. Long-lived agreements must treat all parties fairly. Photo courtesy U.S. National Park Service. When two parties negotiate a written agreement, one partner usually does the drafting. We'll let Donald be the drafter, and we'll call the Other partner Olivia. Here are some deceptive techniques available to drafters. See "Extrasensory Deception: I," Point Lookout for October 22, 2008, for other deceptive negotiation tactics. Donald agrees to drop language cited by Olivia, but in redrafting, he inserts new language that has the same effect, albeit somewhat more artful. He then presents it as a serious attempt to address Olivia's concerns, and he might even say, "Shall we move on to the next section?" Donald's behavior is a deception, intended to suggest that Olivia's concerns were addressed, when they were not. The more clever operators might even materially weaken Olivia's position. Donald agrees to add language Olivia requested, but he also inserts conditions that weren't requested, and which erode the effect of the requested language. This deception is related to the Non-Redraft Redraft, but it applies to the requested addition of new language, rather than to the revision of existing language. It can be more subtle because the bonus changes might have been inserted elsewhere. When Donald returns with the redraft, he's made the changes that were discussed, but he's also made some unrelated changes that weren't discussed. During the walkthrough, he omits any mention of the unexpected revisions, or mentions them only in passing. He pressures Olivia so as to limit the time she has to contemplate their impact. Unless Donald is a master of pressure, this tactic can be risky for him. If Olivia discovers what he has done, she'll probably cease trusting him, and that might lead her to review the entire document. To limit this risk, Donald might try the next tactic, Late Delivery. A reasonable response to Late Delivery is "We have to reschedule." Olivia can say, "I just received it, and I need to review it," but that does open her to Donald's feigning offense or using some other pressure tactic. Sometimes it's more fun just to say, "I have to water my begonias." Would you like to see your comments posted here? rbrenbeoACUZXDKaTAiDqner@ChacjGHRGzSDuCXsndaboCanyon.comSend me your comments by email, or by Web form. Detecting lies by someone intent on misrepresentation is an important skill for executives, managers, project managers, and just about anyone involved in knowledge-oriented organizations. Here's Part III of our little collection of lie detection techniques. See also Ethics at Work and Workplace Politics for more related articles. I offer email and telephone coaching at both corporate and individual rates. Contact Rick for details at rbrenjFresUXmKvhLyOnMner@ChacsPXCKFDqLZayelzSoCanyon.com or (650) 787-6475, or toll-free in the continental US at (866) 378-5470.